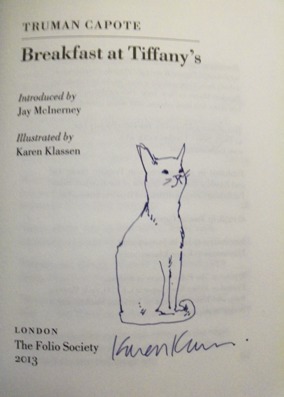 UK Hardback first Folio edition - signed and remarqued by the artist Karen Glassen. Synopsis : It was a warm evening, nearly summer, and she wore a slim cool black dress, black sandals, a pearl choker’ Beginning with a chance glimpse in a shared apartment building, Truman Capote’s enchanting novella charts the friendship between an aspiring writer who has just moved to New York City, and his neighbour Holly Golightly: girl about town, genteel gold-digger and free spirit. It is one of the quintessential American stories of the 20th century. Blocked with a design by Karen Klassen.